Puppy Linux Discussion Forum :: View topic - How do I mount device without displaying file-list? Have you tried adding the /usr/share/defaultfilemanager.desktop file I suggested, http://murga-linux.com/puppy/viewtopic.php?p=1012213#1012213 ? By the way, I can't suggest a hunt for the version I mentioned as, like the second screenshot in Mike Walsh's post, it doesn't display one. I've just come from Slacko 571 (where the 'FileManager' entry is very definitely 'present & correct'), and booted into my own copy of Tahr 606. BK, you're quite right; there is no 'FileManager' entry showing up in either of the Default Choosers. And I know why, too. Both Pups have the 'puppyapps' script' in /usr/sbin. But if you open the two of them up, side-by-side, in Geany, you can see the difference. Assuming that Phil has used the original script, as produced by Ziggy, I can only postulate that Sailor, when creating 571 before the final re-master of its ISO, added an extra entry for 'FileManager'. I can't somehow believe that Phil, of all people, would have gone out of his way to remove said entry.....so I'm inclined to believe my first statement; that Sailor did some additional coding and added the extra entry. BK, this one's an easy 'fix'. All you need to do is install the attached .pet (it merely substitutes the Slacko 'puppyapps' script for Tahr's). No reboot/restart of 'X' is required. Then, go to /Menu->Setup->Puppyapps Default Applications Chooser. As shown in the image, where 'rox-filer' is shown, just delete the entry and type 'pcmanfm' instead (yeah, I know; it ought to show in the list, but they don't always. I think in this case it's because 'pcmanfm' shows as a shared library rather than a binary..?) Then 'OK' it. Now, when you click on the desktop 'Files' icon, PCManFM will start every time, instead of ROX. Should you ever want to change back, just reverse the process, and type (or select) 'rox-filer' instead. This hasn't been a waste of time, because although I love ROX, occasionally I find myself hankering after something different. Now that I know the default can be changed, I'm going to do some experimenting..! 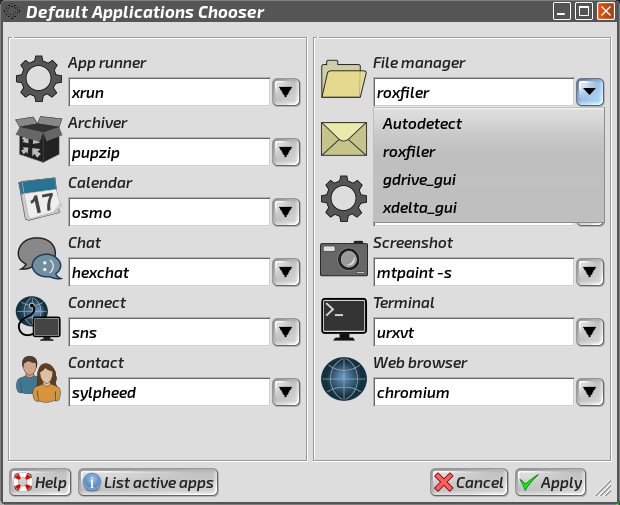 Description Modern 'Default Applications Chooser' upgrade .pet; re-instates/adds the 'FileManager' entry. Your pet did the job - File Manag=rox-filer appeared. I was surprised when I opened the drop-down box to see both emelfm2 and doublecmd listed. Chose emelfm2 but nothing (I could see) happened when I clicked a drive icon. I got some work to do. Reverted to rox-filer and all is well again. /usr/local/bin/rox is only a script to execute /usr/local/apps/ROX-Filer/AppRun, so why not change the exec-command to something else? you would have to do a search for the code as files differ on slacko and tahr. I tried this with emelfm2 as the default file manager. I think the problem is emelfm2 wants to start based on settings in it's config. If you go to the config>General it gives option for where in the file system it opens. With clicking on a drive icon being /mnt/whatever the drive is. That /mnt/whatever is not a config option for emelfm2 startup.